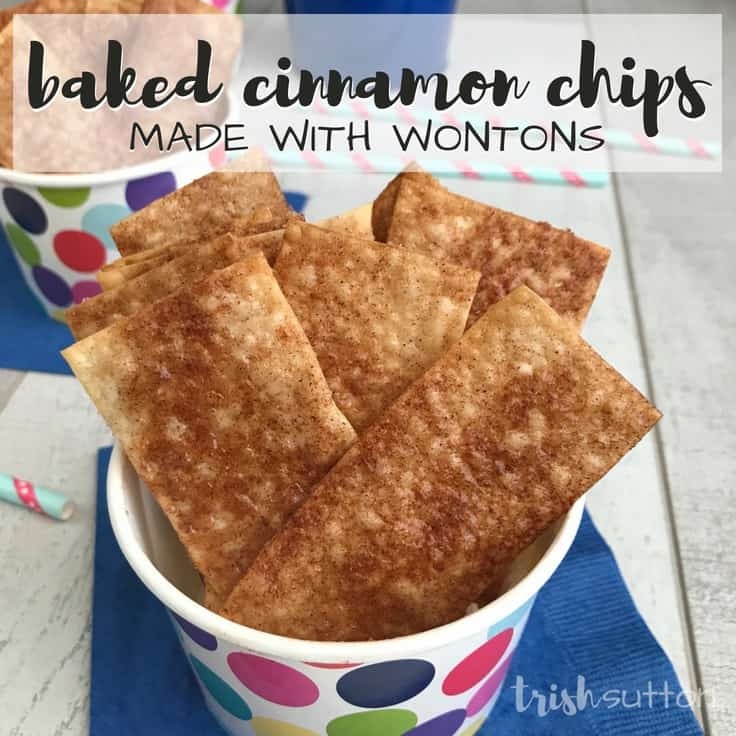 These amazing Baked Cinnamon Chips are light, crisp, sweet and easy to make! Hey there Kenarry Readers!! 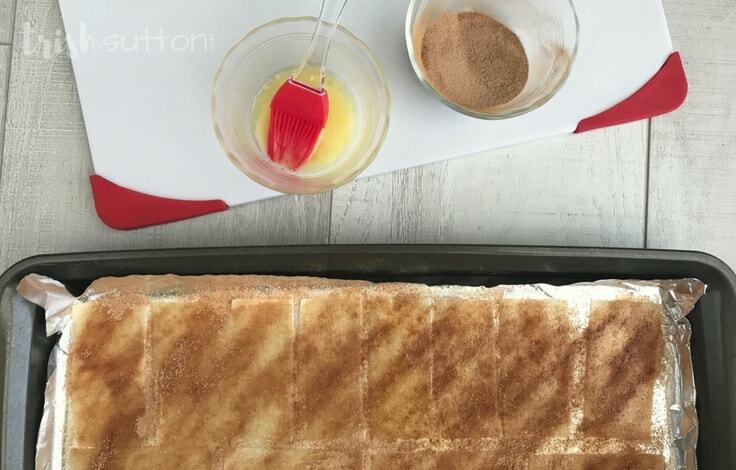 Trish here with a recipe made for those who like cinnamon. 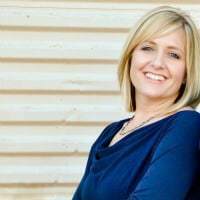 Which is everyone I know EXCEPT my husband. If you remember my Grilled Pineapple Glaze you already know that I happen to be a fan of cinnamon. 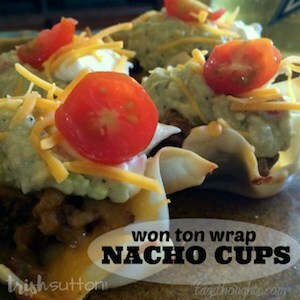 A couple months ago I decided to create a sweet treat with leftover Wontons. The end result was a sweet crispy goodness that both of my boys approved of and one that I immediately fell in love with. What’s not to love about sweet simplicity? If 96 chips seem like a few too many this recipe can easily be split in half. 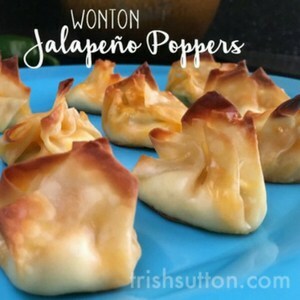 Of course, after you try your first one you will wish you had made the entire package of Wontons! 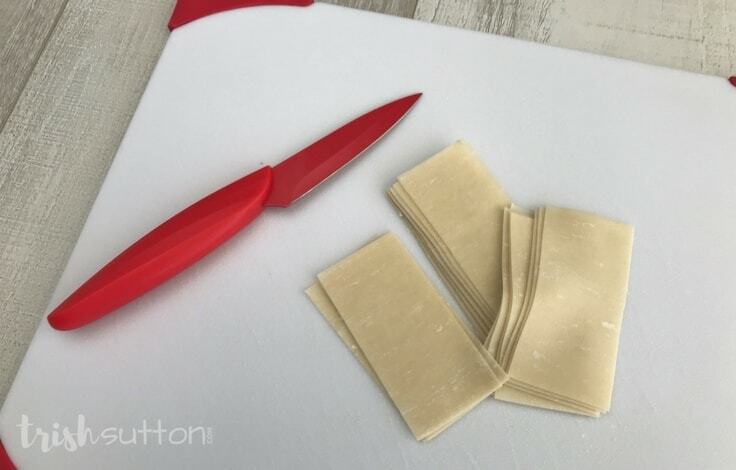 Begin by cutting the Wonton Wraps in half to create strips. 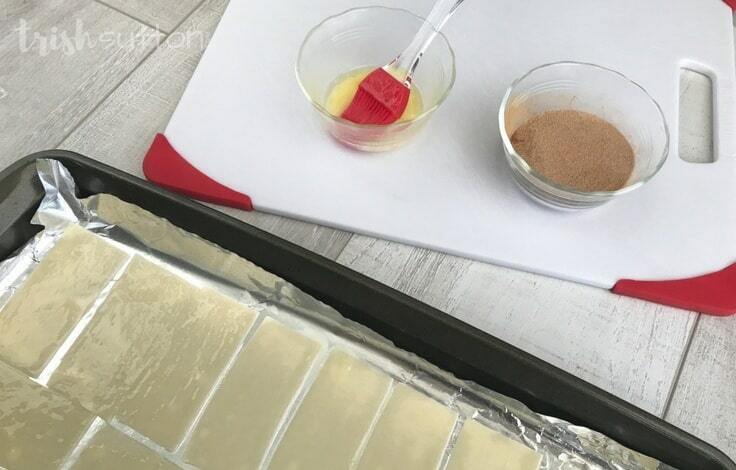 Prepare a baking sheet with a sheet of aluminum foil then lightly spray a layer of cooking spray onto the foil. 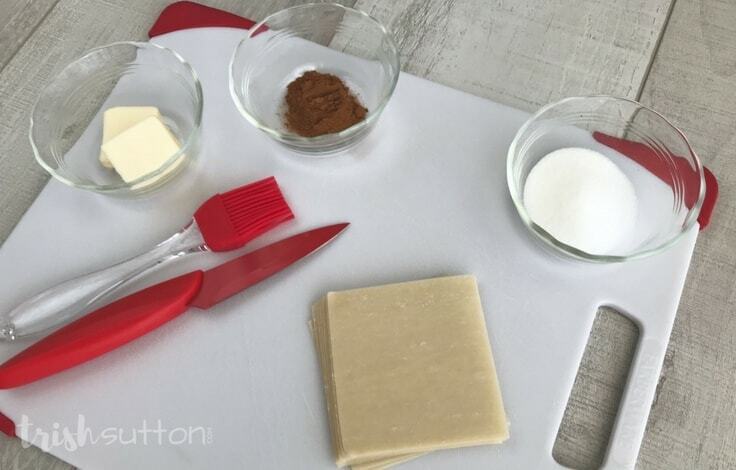 Place a single layer of Wonton strips on the baking sheet. 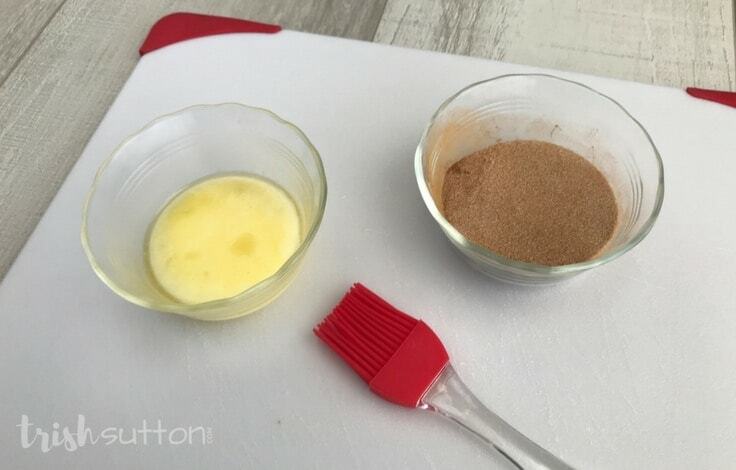 Pour the cinnamon and sugar into a bowl together, use a fork to mix until well combined then set it aside. Melt the butter in a microwave-safe dish. The time may vary; however, I heat my butter on high for 45 seconds. Brush the melted butter over each strip then sprinkle the cinnamon and sugar mixture over the Wonton strips. Remove your Baked Cinnamon Chips from the oven and allow them to rest on the pan for one to two minutes. Enjoy them warm or store in an airtight container for later. Pour the cinnamon and sugar into a bowl together, use a fork to mix until well <g class="gr_ gr_115 gr-alert gr_gramm gr_inline_cards gr_disable_anim_appear Grammar multiReplace" id="115" data-gr-id="115">combined</g> then set it aside. Melt the butter in a <g class="gr_ gr_109 gr-alert gr_spell gr_inline_cards gr_disable_anim_appear ContextualSpelling ins-del multiReplace" id="109" data-gr-id="109">microwave safe</g> dish. The time may vary; however, I heat my butter on high for 45 seconds. 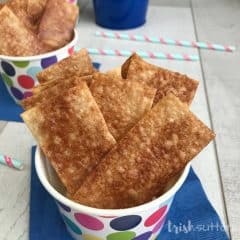 Brush the melted butter over each strip then sprinkle the cinnamon and sugar mixture over the Wonton <g class="gr_ gr_108 gr-alert gr_spell gr_inline_cards gr_disable_anim_appear ContextualSpelling ins-del multiReplace" id="108" data-gr-id="108">strips</g>. 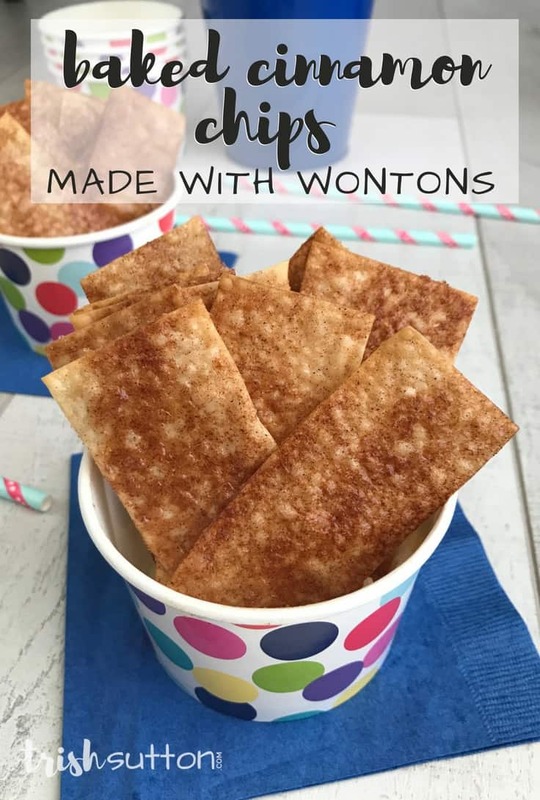 Note: If you do split this recipe in half you can use the rest of the Wontons to try out another one of my recipes made from Wontons below!